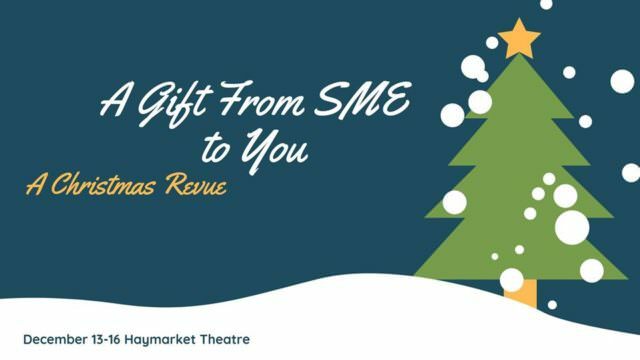 Summer Musical Enterprise presents "A Gift From SME to You: A Christmas Revue" at the Haymarket Theater located within the Squires Student Center on the campus of Virginia Tech with performances starting on Thursday, December 13, 2018 through Sunday, December 16, 2018. "A Gift From SME to You: A Christmas Revue", spotlights Christmas selections from musicals, from the classics to today's Holiday shows! The Revue features solos, duets, small group numbers and fun choreographed company numbers sure to get you in the Christmas spirit! Tickets are $12.00 for adults ages 18-59, $10.00 for teens ages 13-18 and $6.00 for seniors ages 60 or better and children 12 years and younger. Tickets are available online, visit: https://co.clickandpledge.com/advanced/default.aspx?wid=149214. To view the event flyer, visit: https://i.imgur.com/NyXIl2T.jpg. For more information, visit: https://summermusicalenterprise.org/christmas-revue-announcement/ or https://www.facebook.com/SummerMusicalEnterprise/.